This Xerox brand high yield magenta toner cartridge is compatible with the Brother HL-L8250CDN, HL-L8350CDW, HL-L8350CDWT, MFC-L8600CDW, and MFC-L8850CDW and yields up to 3,500 pages. Replaces OEM part number TN-336M. 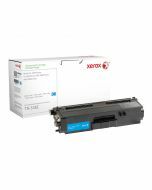 Xerox replacement cartridges are a high-value alternative to non-Xerox OEM cartridges and come with a 100% lifetime warranty. Get free standard shipping on all supplies. 13" x 4.13" x 6.38"